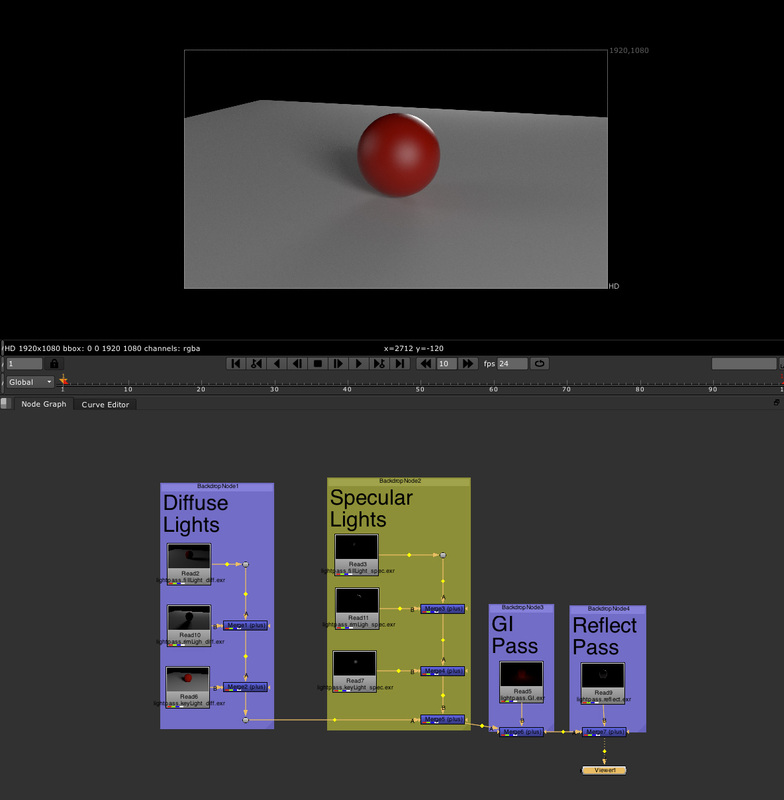 Using Vray Render Elements, Making Specular Vray Materials, using Vray_Light_Select, basic Vray Compositing in Nuke. 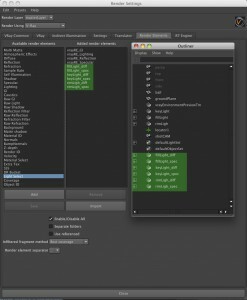 UPDATE: May 7 2012 – The script wasn’t working correctly in Maya 2012 and Vray 2.2. It’s been updated to now work properly. 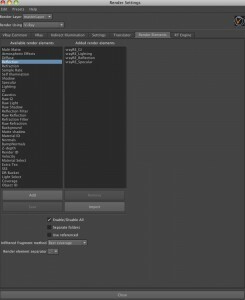 In my opinion, the only one that requires a little more fiddling, as well as opens up a wide variety of user mistakes is the vrayRE_Light_Select. 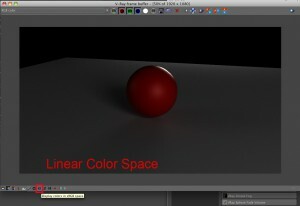 This tutorial will only cover very basic light pass/compositing techniques to demonstrate the Light_Select technique and introduce a nice MEL script to make your life easier. 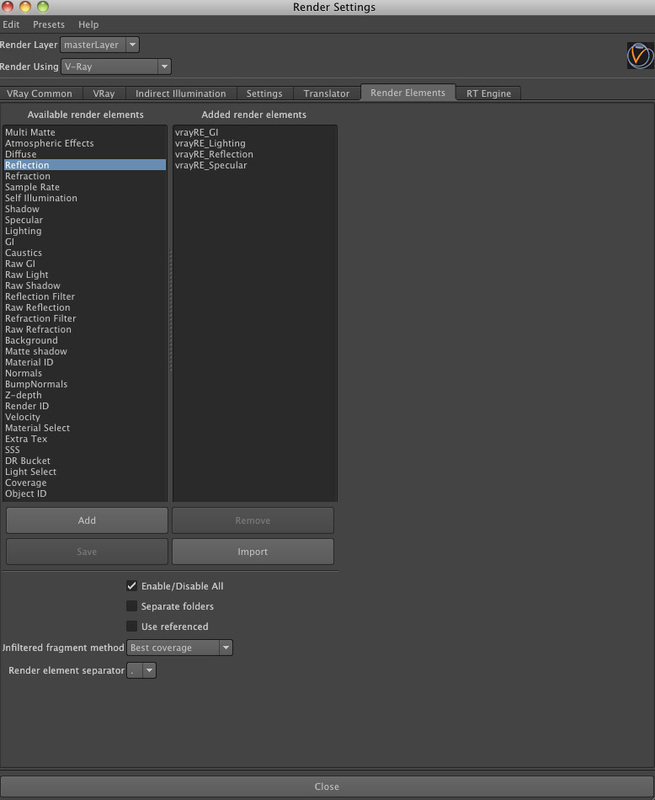 The first thing necessary for working with your render elements is to switch over to the Vray VFB (Vray Frame Buffer) to view your images and passes. 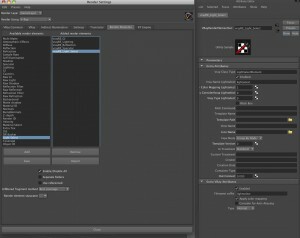 This will also allow you to quickly view your images in both linear and SRGB color space. Figure 2. Three Light Scene. 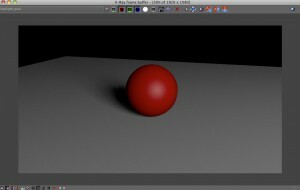 I built an simple example scene with a sphere and ground plane. In addition I created three Vray rectangular lights for standard three point lighting. 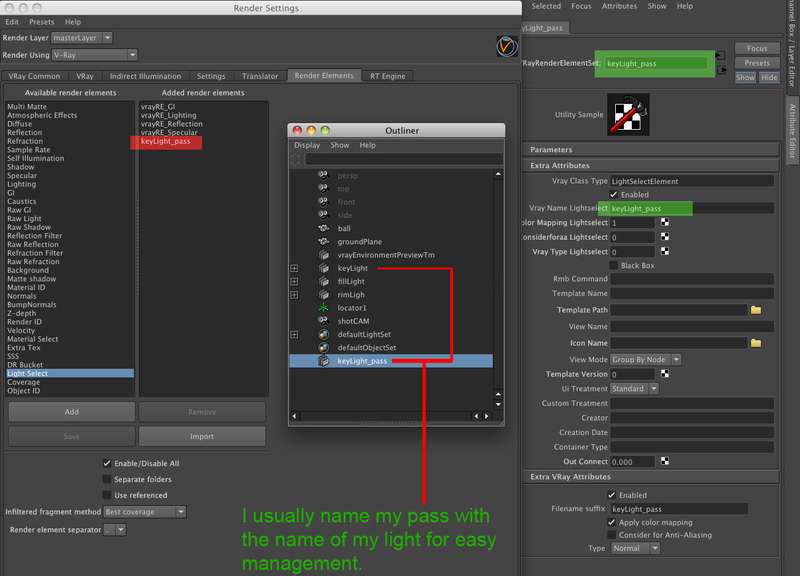 You’ll notice right away I’ve named my lights and objects. It’s just a good standard practice. It can be as complex or simple as you like, but later on knowing which light you’re looking with or modifying in compositing makes it priceless. The first thing we’ll do is set up our Render Elements found under the Render Settings. You’ll see a huge list of possibilities under this tab, but for simplicity we’ll just do one of the more basic setups. As I mentioned before, we’re just going to focus on these basic controls since the point here is about Light Passes, not advanced compositing and pass management. A little note about the specular pass and specular materials in Vray. 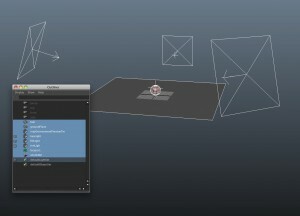 More spec and less reflection on an object is controlled by the “Reflection Glossiness” in the Material Editor. Glossiness set for a mix of spec and reflection. So for our test I want a mix of both, with hot spec we can see, hence my .632 range. Figure 5. 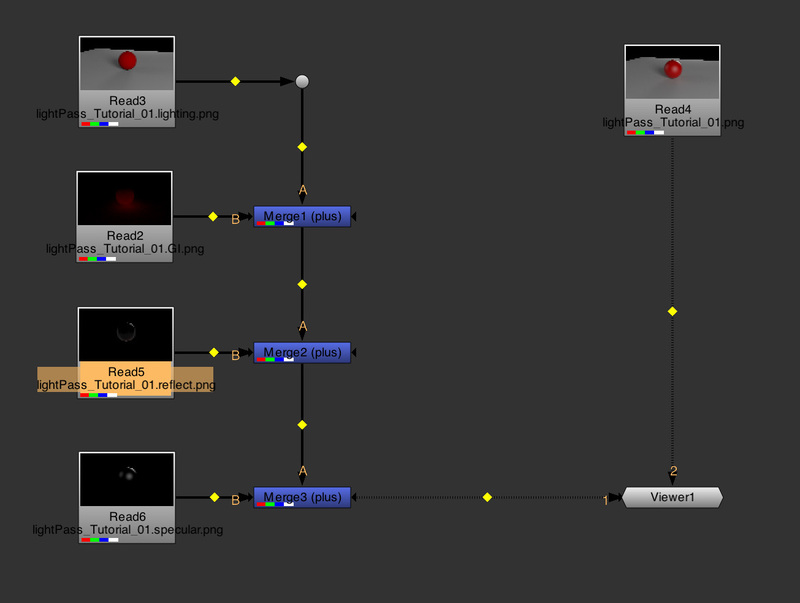 Render in SRGB color space. 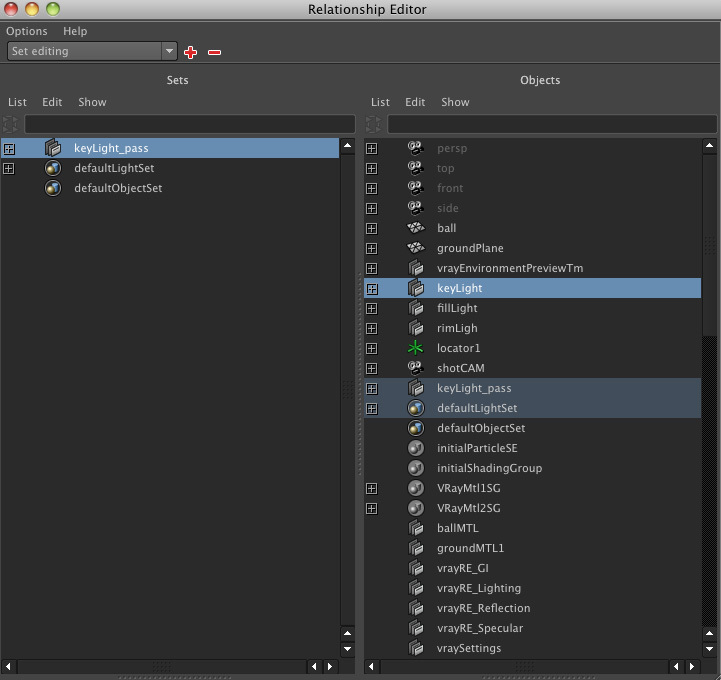 Now with the lights set, material set and render elements set we can render. Figure 6. 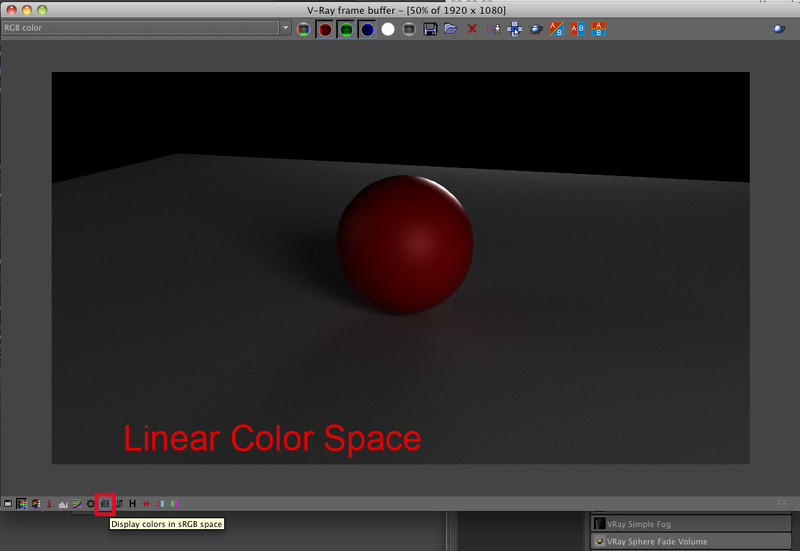 Linear Color Space button. 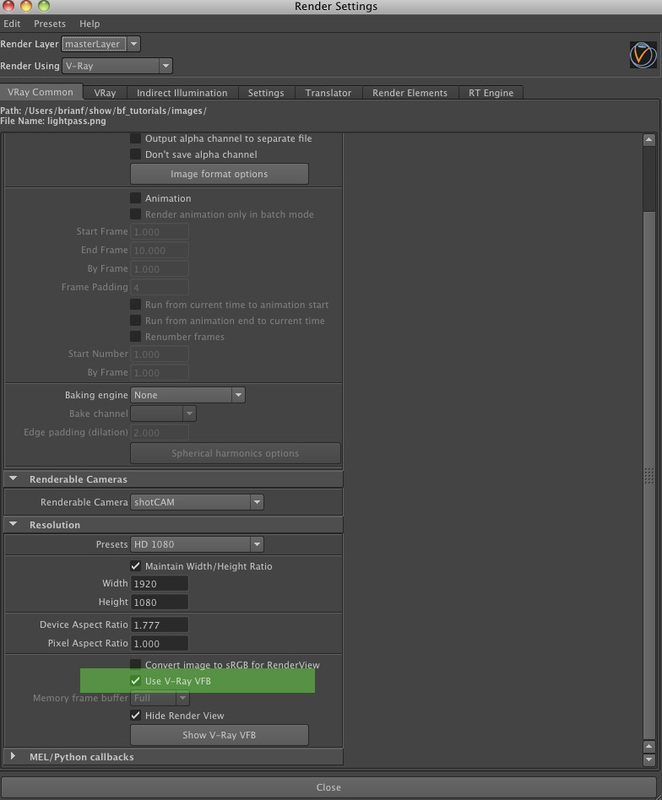 To switch between linear and SRGB color space you need to click on this button. I will be writing a tutorial in the future on Linear Workflow, but if you’re unfamiliar with it basically in Linear color space the image should look far darker than the SRGB space. 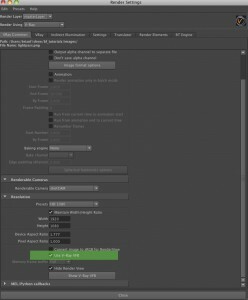 SRGB is how we’re seeing it on our monitor, Linear is the “true” color space and gives us more room to move in compositing especially with our whites/blacks and other post correction. Figure 7. 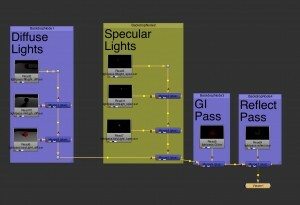 Lighting Pass Only. Next up is our ability to see our passes using the VFB. What we’re looking at in the “lighting” pass is simply the combination of the shadow and diffuse pass. We’re also left with very limited control of the lights. So, how do we break each light out separately? We’re going back to our Render Element Tab in the Render Settings and a new pass. 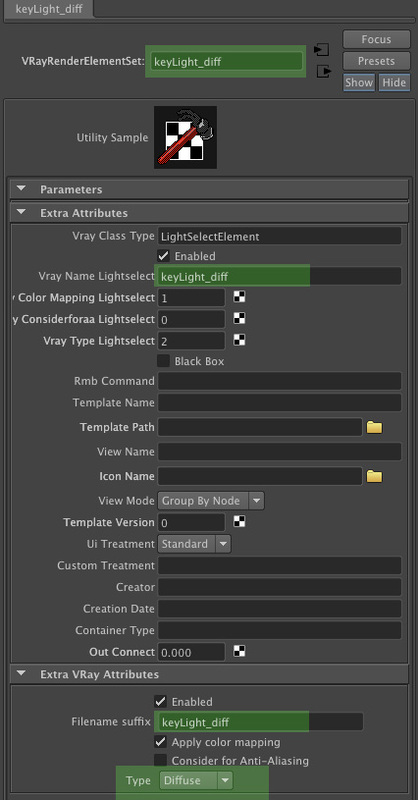 At this point we’ll need to use the VrayRE_Light Select to isolate our lights. As a test we can just set one up quickly and hook into the render. Just double click on it as you would any pass and it should appear in the right column. 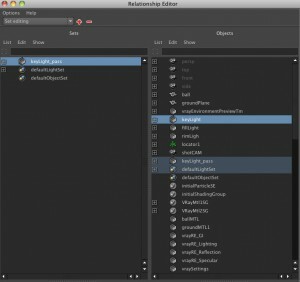 Just like we wanted to name our lights earlier, we’ll want to name our Light_Select to know which light it’s controlling. Let’s start off by using the keyLight for our test. I’m just changing the fields highlighted in green. The top one effects how it’s seen in the render elements tab as well as the outliner. The field below it in green effects how it’s seen in the next step, the set editor. We’ll get into the more advanced functions of this later. Just because the pass was created and named the same as the light doesn’t mean it automagically knows which light to connect to unfortunately. So we’ll have to open up the set editor. 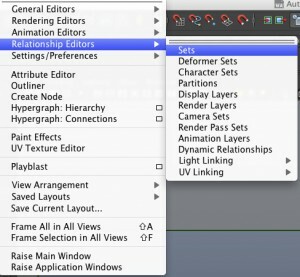 Once the window comes up any Vray Light Select element we’ve made should show up in the left column. 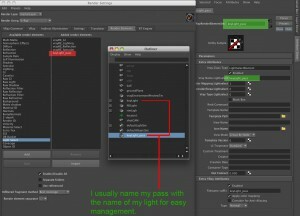 This is also why naming your light pass and light is relatively important. We’ve got the light now seperated, but comparing it to the lighting pass and the specular pass we can see that the new pass (keyLight_pass) has not only the lighting, but the specular combined. This will be a problem later on in compositing since generally having your light pass and spec pass separated give a lot more control. 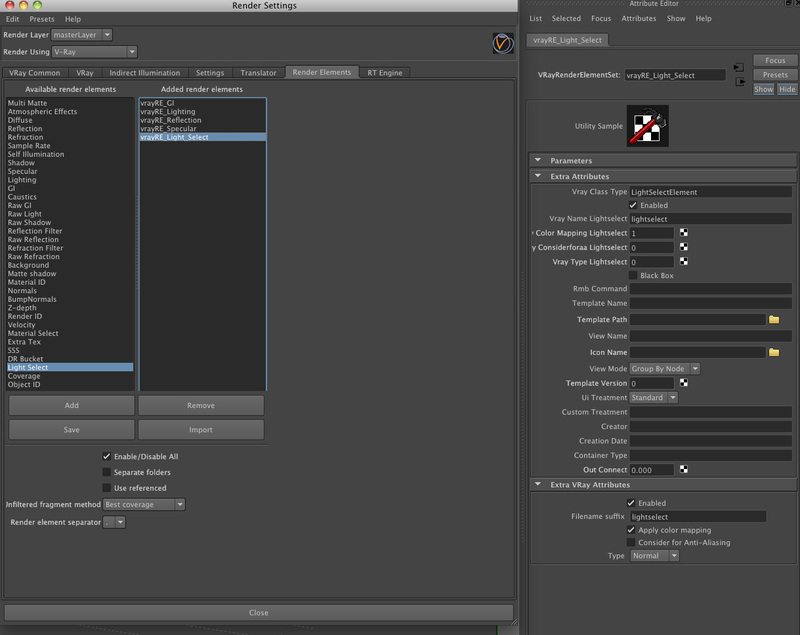 We left it at default, so now we’ll switch it over to “Diffuse” and re-render the image. Figure 16b. keyLight_diff / diffuse pass only. The new render shows that we lost all the spec from our first render. That’s good, but we’ll need to make another pass to get the spec and hook it up in the set editor. Setting this up for production at this point would require six passes just for the lights. (Three Diffuse and Three Specular) Doing this manually can be a major pain. So I wrote a mel script to do all this for you. I walked through the process of doing this manually so we’d understand what’s going on under the hood. //Feel free to steal, edit, modify. You can also download it here if the wordpress formatting throws you some errors. Start by sourcing the code. Then select the lights you want to make passes out of. 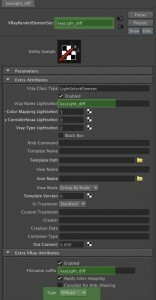 I created a keyLight, fillLight and rimLight so I’ll select those three. Now I’ve got six passes, all properly named and all properly assigned. I really don’t need the original lighting pass or the original specular pass anymore, but I keep them around so when I comp the shot I have something besides the beauty pass around to make sure I got everything right. 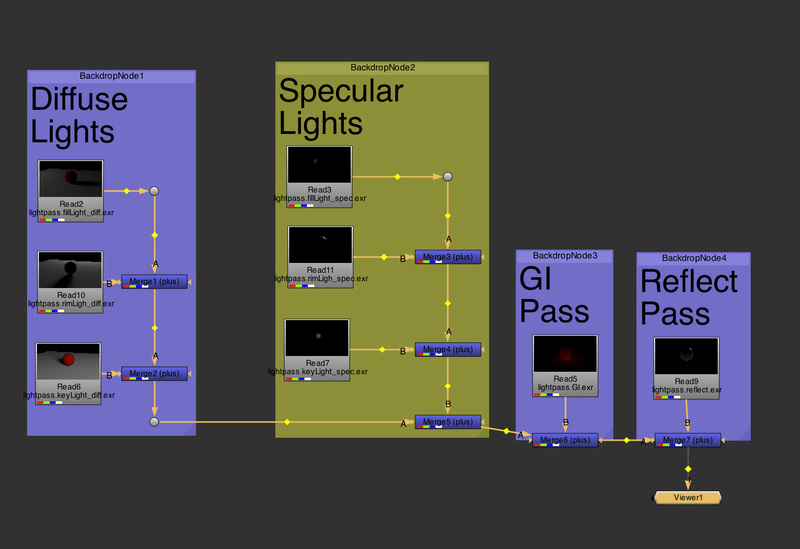 So now we re-render the image and we’ll take a look at the rimLight_spec pass. So that’s it. All our light passes are broken out. Be aware, you CANNOT break out your reflection per light, the render engine doesn’t work that way. There are comp tricks using the light or spec pass to dial up or dial down your reflection per light, but as a pass, it’s all or nothing. Same goes for Refraction. 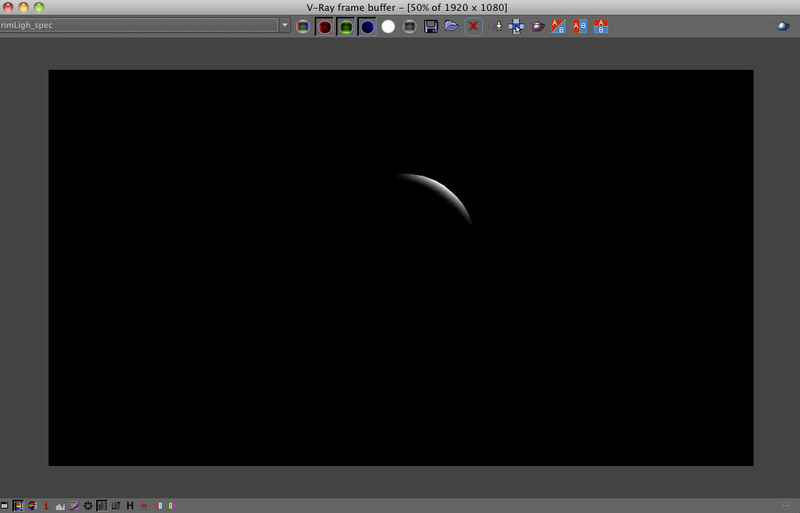 And that’s basic light pass/compositing with Vray. 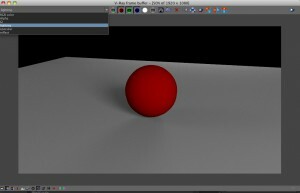 This entry was posted on Monday, February 20th, 2012 at 7:58 am. It is filed under CG, Maya, Mudbox, Nuke, Tutorials, Vray and tagged with Maya, Nuke, Vray, vray compositing, vray light select, vray light select re, vray light select render element, vray lights, vray Render Elements, Vray Specular, vray_light_select. You can follow any responses to this entry through the RSS 2.0 feed. man, just went over this again. so clear. thanks. It was the stupid wordpress formatting. I changed the text format and tested it, it should work now. Thanks for letting me know that was still messed up. Now with the fixed formatting it runs fine, but it doesn’t produce any connections as it should from the selected light and pass as it does in the video tutorial..no errors as well..seems strange. It works fine,my bad because I didn’t run it manually (vrLightPass; in mel command line). Thanks a ton Brian for your efforts,really helpful script. Thanks for the great in depth tutorial. But I have one question, how to get the Light Select pass to work with transparency?